How to Make an Amazing Website Even if It’s Your First One! Want to know how to build a website the fast, easy way? You’ve come to the right place! We make it very simple for you to create an amazing website even if it’s your first time making a website. We show you how to build a website in just three easy steps! Our simple to use website builder guides you step by step through the entire process. It’s like a trusted teacher is with you every step of the way showing you how to build a website. Best of all, it’s so simple that you can build a website in less time than it takes to make dinner! So, exactly how do you build a website? Watch the video below and see just how easy it is to build a website then click here to build your own website. We have over 1500 Designs and 28,000 Images to Choose From when You Build A Website! We not only show you how to build a website, we make it very affordable! You can make your own amazing 5 page website for just $8.95/month! 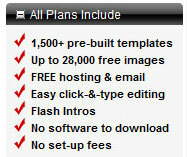 Talk about a great deal – for less than the cost of lunch at a restaurant you can have your own web presence! What’s more is that the price covers not just our simple to use website maker which has over 1500 great designsto choose from but also web hosting, email and much, much more! Plus, unlike some companies, there’s never a set up fee to build a site with us. It’s really simple to build your own website with our easy to use website creator but if you ever do need help or have questions, we have friendly representatives standing by 24 hours a day to assist you. We have been in business since 2001 and we aren’t going anywhere. We WILL be there for you if you need us. Now you know just how to build a website that looks amazing and is affordable. You also know we will be there for you if you need help. What’s left to do? Just click here to get started today! For more information on how to build a website, click here.